Discussion case 6 is a 68-year old gentleman who presented with an intoeing of his gait. This was on a background of a modular total right hip replacement. He had no pain at presentation with good function of the joint. Gait intoeing is an early sign of abductor muscle damage due to unopposed action of tensor fascia lata. To investigate the muscle mass and any changes, an MRI was requested - See below. These pre-operative radiographs show a femoral stem with a modular neck. There are no obvious abnormalities related to the right hip joint seen on these plain film radiographs. The pre-operative MRI demonstrated a subtle pseudotumour anteriorly and a second thick-walled pseudotumour surrounding the greater trochanter - Coming soon. 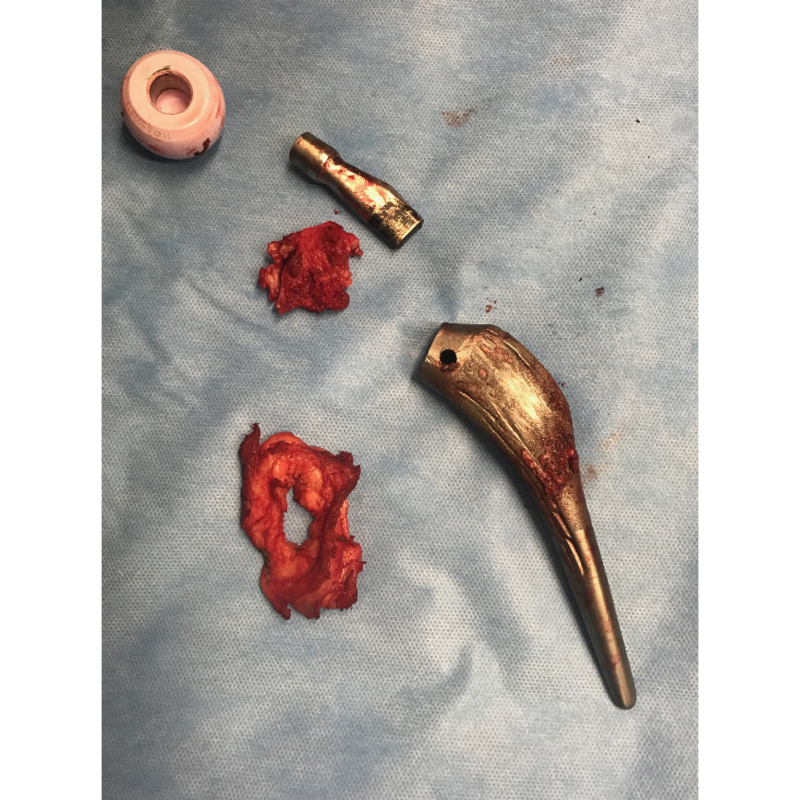 Adverse reaction to metal debris caused by wear of the modular neck from the femoral stem. This led to pseudotumour formation and surrounding soft tissue damage. CT planned revision of the left hip. This was stable. The leg lengths were equal. The post-operative plan was partial weight bearing for 6-weeks with crutches and clexane. This intra-operative image demonstrates the destruction caused by the metal ions released from the taper junction between the femoral stem and the modular neck. Areas of corrosion can be seen on the modular femoral neck (the black debris). Note the marks in the femoral stem, made at the time of explantation. Post-operative radiograph with the revision stem in situ. He returned to clinic at one-year post-op able to walk as far as 6-miles. He is a very active gentleman and is able to continue doing his daily routine of exercises. The wound had healed well and examination of the joint was normal. Modular neck hips (aka dual taper) with cobalt-chromium necks produce metal debris from corrosion between the neck and the titanium stem. The stem is always titanium for a modular neck hip. The metal debris can destroy muscle and tendon. MRI can see this soft tissue destruction and revision surgery should be contemplated before the tendons pull off of the trochanter and before the muscle is damaged: surgery after this results in a very poor outcome. All designs of modular neck hips, that have a cobalt-chromium neck, are vulnerable to this problem.